How much time do you spend on your computer, smartphone, tablet, etc.? What about watching TV? 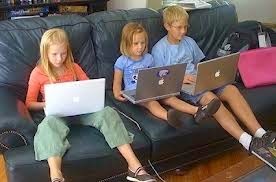 How much screen time do you allow your kids? And how much pure non-screen time do you spend a day (not counting sleeping)? Have you ever calculated how much time you spend playing or working with all kinds of electronic devices? Last month, as we set down for our family dinner, I looked over at my husband and he was eating and reading the evening news on his Blackberry at the same time. I gave him a dirty look to which he responded "You're not talking, so why not?" At this rate I will start reading magazines and give the kids a book to read while they're eating as well, and we can all open up a book club while we're at it, why not?! Now, we have another rule in the house: no phones or TV, or iPad usage while we eat! I find it absolutely terrible how dependent we've become on our electronic devices. As soon as we wake up, we look at cell phones to see who messaged us, or what important email we've missed, all before we even have time to go to the bathroom. And what about while playing with our kids? Is your TV on in the background most of the time? 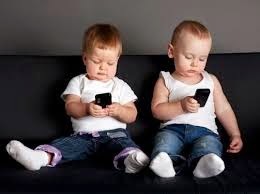 Are you checking and messaging on your smartphone while you're playing with your kids? How much true quality time do you actually dedicate to your kids. Pay attention closely and see it for yourself one day. I dare you! And, believe me, kids know it when you don't give them 100% of yourself, and they don't like it. Why should they? They deserve 100% attention from you. If you work full time, I think it's reasonable for your kid(s) to ask 100% of the little time you have left for them in your day. Think about it. I hope I'm making you feel guilty;). I feel guilty as I look at my 3-month-old daughter crying because I'm blogging away instead of giving her my full attention. As adults, we're even more succumbed to the evil effects of technology than our kids. And we continue to pass on this terrible gene to our kids. You see 1-year olds spending hours on their personal iPads, babies watching Baby Einstein cartoons non-stop, and so on. It's an easy way out for parents to get some free time away from the kids. Let's face it - often it's easier to get something done if your kids are sitting and watching cartoons. But, is it really necessary? And why do we want this free time away from our kids in the first place? I honestly don't know, since we don't get much of it to begin with. And what does research say about kids and screen time? According to many studies, kids of today are spending more time than ever in front of screens, and it may inhibit their ability to recognize emotions, and do well in school. 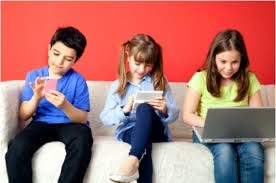 Instead of spending more time playing outside with friends, playing board games as a family, playing at home with siblings and/or toys, we continue to encourage our kids to watch cartoons and play with their smartphones and tablets. I look at teenagers today and I see them laying on their beds texting friends instead of getting together, or sitting in front of the screen all week-end long playing video games. When I went to Teacher's College, I had an amazing professor who opened my eyes to see how the brain works, especially when watching TV. In a nutshell, if you watch TV shows/movies/series that do not give you any intellectual challenge, your brain and your intelligence will not grow. And, when your brain hasn't developed fully yet, you are limiting its ability to grow during an important stage in life. This is the reason why kids should not spend all day watching TV! Watching TV is a passive act; we are not activating our brain cells at all as we are not engaged most of the time (and with my munchkins, I see them rather staring at the screen without paying attention to anything else around them). I think this should be a wake-up call for us, parents, to cut down on technology and make sure our kids are getting enough face-to-face social interaction, and more pure quality time as a family. And this means reducing screen time! I've read some studies that recommend limiting entertainment or screen time to two hours a day for children ages 3-18. And, for 2-year-olds and younger, none at all. The prescription at our house is no more than 1 hour a day of screen time, i.e. TV, iPad, iPhone, and all other media combined, and I'm trying to cut that down to 3-4 days a week only. And, this includes my 2-year-old as well. 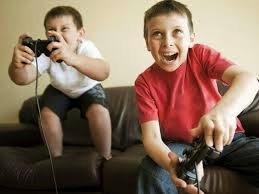 How can you show cartoons to one sibling and not the other when they are of age to understand the fun of it? I also try to stick to educational screen time; for instance, engaging and educational apps on the iPad, e.g. puzzles, learning the ABCs, learning shapes, and so on. As a family, you need to decide on a "healthy media diet" for your kids. Work together to decide how much screen time should be allowed, and make sure your media content choices are educational and engaging. Remember, than screen time can have lots of negative effects when it comes to kids sleep patterns and social or behavioural issues.